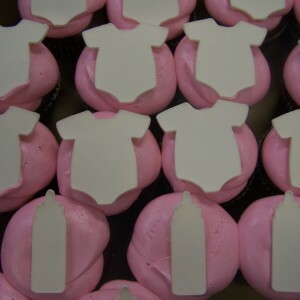 Pricing includes customer’s choice buttercream frosting color & customer’s choice rolled chocolate onesie or bottle color (1 choice), minimum order of 1 dozen. These cupcakes feature a rattle out of rolled chocolate. Pricing includes customer’s choice of (1) color for the rattle and 1 color for the buttercream. 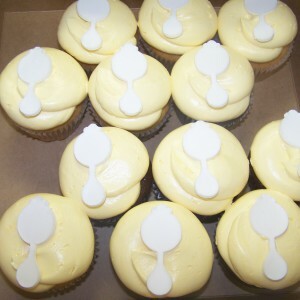 Shown as a light cw yellow buttercream with white rolled chocolate. One dozen minimum per design. 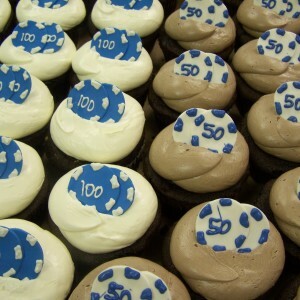 These cupcakes feature a poker made out of rolled chocolate. Pricing includes customer’s choice of (1) color for the poker chips with white detail or white poker chips with 1 color detail and vanilla or chocolate for the buttercream. One dozen minimum per design. 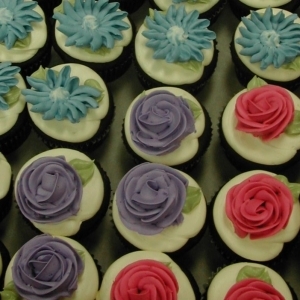 This design feature vanilla butter cream frosted cupcakes with assorted flowers. Daisies available for ($0.75) additional charge. Minimum order of 1 dozen per flower. 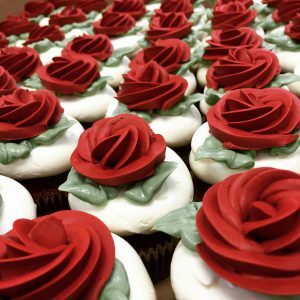 These cupcakes feature a handmade buttercream rose on top. One dozen minimum required per flavor and design. Specific color flowers are available with 4 day’s notice. Chef’s choice, mixed pastel flowers are available with 24 hour’s notice. 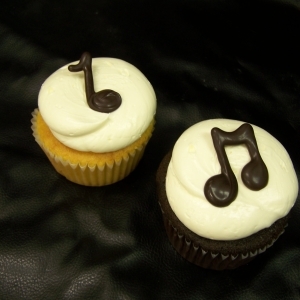 This design features vanilla or chocolate buttercream frosted cupcakes with chocolate music notes. Available with 7 days notice, limited availability if ordered Wednesday for the weekend. One dozen minimum order. This design features customer’s choice 1 color buttercream frosting with chef’s choice colors chocolate butterfly. 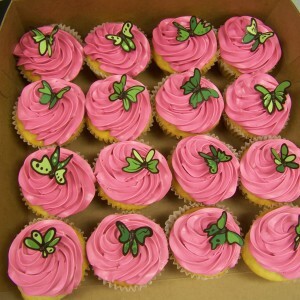 Shown in dark cw pink buttercream & lime butterfly’s. Minimum order of 12. This design requires 7 days notice, limited availability if ordered by Wednesday for the weekend. Hand cut martini glasses sitting on a contrasting Rolled chocolate disc. 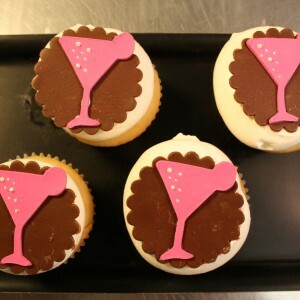 Available as customer’s choice for color martini glass & backing disc colors. Shown as a hot pink glass on dark chocolate disc. One dozen minimum order. 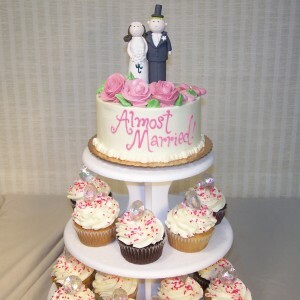 This design features vanilla buttercream with customer’s choice sprinkles and plastic diamond ring. Available with 7 days notice, limited availability if ordered by Wednesday for the weekend. 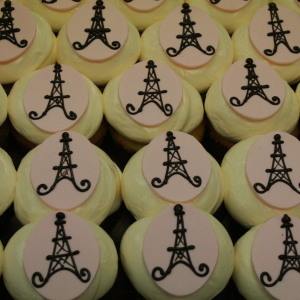 This design features customer’s choice 1 color rolled chocolate oval disk with dark chocolate detail Eiffel Tower. Shown as light pink disk. Minimum order of 1 dozen. Available with 7 days notice, limited availability if ordered Wednesday for the weekend. 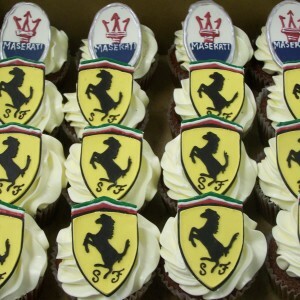 This design features rolled chocolate Ferrari logo on vanilla buttercream frosted cupcakes. Minimum order of 1 dozen.